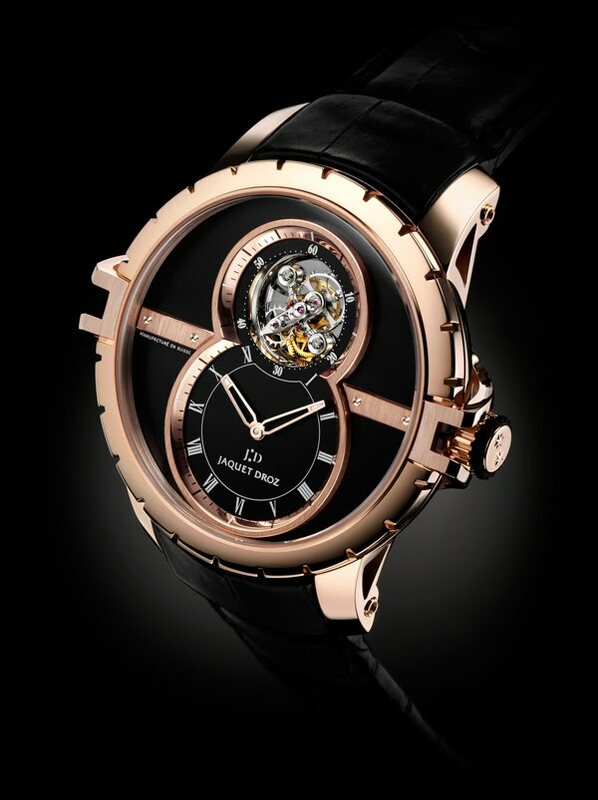 In 2011, Jaquet Droz surprised the world of watchmaking by incorporating the tourbillon, a complication that frees the mechanical watch from the effects of gravity, into the brand's iconic Grande Seconde model, whose dial design takes inspiration from a house leitmotif: the number eight. Today, Jaquet Droz has decided to reinvent this fusion: for the first time, it will be including one of watchmaking's most challenging complications in its line of sports watches (SW), the first of which was presented in 2008. To meet the challenge, the master artisans from La Chaux-de-Fonds pushed back the limits of watchmaking mechanics. Inserted at the top of the dial, the tourbillon reveals the extraordinary complexity of its mechanism. The upper bridge has been changed to perform the function of the seconds hand, whose elegant profile harmonizes with the sporty look of the watch. Positioned opposite, the hours and minutes counter uses classical Roman numerals, giving them, as well as the hands, a coat of white Super-LumiNova to set up a contrast with the black rubber treatment of the dial. Set horizontally, the plates, carefully secured with screws, convey the perfect graphic balance and chromatic harmony of the Tourbillon. This visual and technical performance comes in a generously sized 45 mm case whose look of power is highlighted by the precious shimmer of red gold and the fine fluting on the bezel. The alligator strap – used for the first time for a sports watch – brings its own special gleam to this exceptional timepiece. The Tourbillon expresses the love of sports in perfect luxury.